The future is here! It's tech that beckons you with a piercing gaze. Look. Go on. Do it. 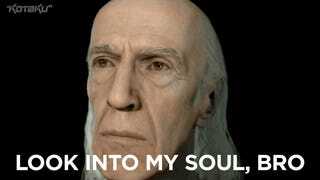 Game developer Quantic Dream created this old man head, which really looks like David Carradine, to show off its PS4 capabilities. I'm sold! Very impressive. Just don't creep me out anymore like this. Cool?